1. More Efficient Food Waste Management. A quality garbage disposal system will assist one in disposing food waste more effectively. Using a garbage disposal system rather than tossing food by products and related waste into the trash is easier and cheaper to community wide costs for waste management. 2. Garbage Disposal Units Are Environment Friendly. An efficient garbage disposal system is by design environment friendly. By further processing refuse into smaller units, refuse will be more receptive to biodegradable conditions. This helps to keep the environment clean. Some report that more than twenty percent of waste in the environment is simply from food byproducts and scraps. The operation and use of a garbage disposal system can help reduce environmental waste more efficiently. 3. Protects One’s Plumbing System. A good garbage disposal system can effectively prevent as well as remove some clogs from one’s plumbing and pipes. This can extend the life of the plumbing system. One will not have to hire a plumber every time they need a drain or pipe cleared. 4. Plumbing Maintenance Calls Are Reduced. As a garbage disposal system works continually to maintain a clean drain, calls to a plumber to fix drain blockages are reduced. 5. One’s Kitchen Smells Fresher. A garbage disposal proceeds to efficiently reduce the garbage to a size that flows quickly and efficiently into the plumbing network that a household is connected to. Garbage which contains food by products which can spoil are not left in the sink drains, the kitchen trash or the one’s garbage bin waiting to be picked up by the weekly trash run. 6. Garbage Disposal Systems Help Create Cleaner and More Efficient Biodegradable Fuel. The food by products which are processed in a garbage disposal unit provides an effective and cheap source of clean, renewable energy as well as a potent bio degradable fertilizer. The operation and costs of a basic garbage disposal is simply minimal once compared to processing food waste for bio fertilizers directly. 7. Rodent and Vermin Populations Are Kept in Check. Garage disposal systems reduce the amount of food in trash which can attack rodents and other animals which can cause harm and disease. Closeup of a plumber using a wrench to tighten a fitting beneath a kitchen sink. Only the man’s hand and arm are visible. Horizontal format. 8. Garbage Disposal Systems Are easy to Install. 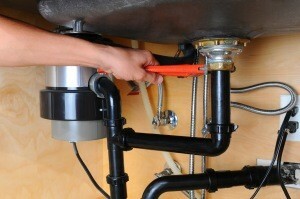 Most systems can be installed by the homeowner and without the need for a professional plumber. 9. Garbage Disposal Systems Reduce Gas Usage. Since more food products are processed into one’s plumbing system, less trash is created which has to be transported to a dump or trash collection area. 10. The Units Are Cheap and Come With Warranties. One can find an affordable system at any hardware store and all carry an extended warranty for service and parts.